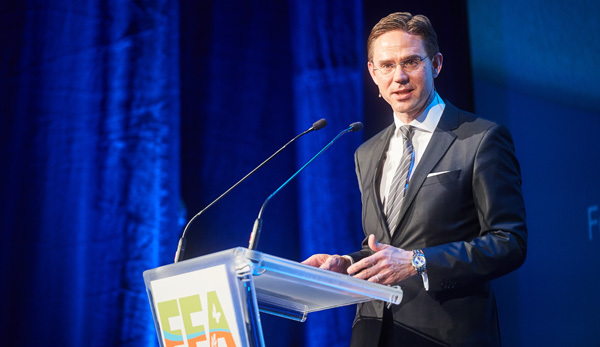 Jyrki Katainen, European Commission Vice-President for Jobs, Growth, Investment and Competitiveness, emphasised the important role that agriculture can play in creating the circular economy. Not only does it provide recyclable raw materials and efficient use of resources, but it also delivers on the Sustainable Development Goals. The Commission recognised the sector’s contributions in its 2015 Circular Economy Action Plan. This specifically includes measures, such as food waste, water reuse and fertilisers, important to agriculture and the food industry. Mr Katainen publicly invited the sector “to develop with us the new circular business models of the future, which would also increase the competitiveness of the CAP and the agricultural sector”. The Commission favours new forms of financial assistance to help farmers move in this direction. It has already demonstrated its support by doubling investment in food and agricultural research and innovation for the period 2014-2020. However, the Vice-President expressed his disappointment that environmental and resource efficiency initiatives were failing to make full use of the potential of the European Fund for Strategic Investments (EFSI). “We have to find ways to stimulate the agri-food chain,” he said, confirming that agriculture, fisheries and aquaculture would now feature explicitly under the EFSI’s general objectives. Commenting on the Commissioner’s keynote address, Geneviève Pons, Director, WWF European Policy Office, urged the Commission to “be much more vocal on environmental and sustainable development”. “The European Union is by nature green. We have this in our genes and we must continue to ensure leadership in this field, now more than ever,” she said, pressing the case, in particular, for a mandatory EU target on food waste and measures to combat deforestation and threats to biodiversity. Daniel Calleja Crespo, European Commission Director-General for the Environment, pointed out that 18 of the Commission’s 54 circular economy actions had already been proposed or adopted and that it aimed to mainstream sustainability across all farming practices. Jon Parr, President, Global Crop Protection and EAME, LATAM & APAC, Syngenta acknowledged that EU governments and the Commission had played a very strong role on the circular economy, Sustainable Development Goals and climate action. “What these things bring for all of us is a framework – an alignment that gives a common set of objectives that we know we are all pulling towards.” Syngenta, he added, aims to help the agricultural sector by developing new technology, bringing agronomy and protocols to farmers and using digitisation and data analytics. “We are happy to work in any region with whichever technologies the region wants to have,” he confirmed.